The Department was established in year 2002 and has been engaged in teaching of courses of social science to the students of UVAS. 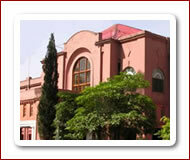 The Department is involved in teaching of courses like Islamic Studies, Pakistan Studies, English and Sociology. With the initiation of new degree programs in the University in current year, the work load of this Department is likely to increase as curricula of all these degree programs, having courses of Islamic Studies, English and Pakistan Studies. Moreover, the department is continuously working on the enhancement of the academics. With previous programs, department has planned to start programs like M. Phil /MS and PhD in Islamic Studies. Another program is under consideration that is of post graduate diploma in Applied Linguistics and language program of English and Arabic. In accordance with the intent behind it, different co-curricular activities like essay writing, calligraphy, poster making, Bait-Bazi, Naat etc. are also in practice under Qirtas Literary Society. Teachers of this department in collaboration with other departments in and outside the University are already involved in conduction of various competitions regarding Qiraat and Naat. Traditional learning is blended with co-curricular activities. These co-curricular activities ensure that our students broaden their views and expand their horizons. The Department opens up a plethora of vistas for the students and shall be continued doing it. Islamic Banking in Pakistan principles and practice. Since the nature of the department is collaborative .its extending cooperation to every degree programme which are taught in the university. Every faculty member of the department is contributing his due share for the attainment of objectives and targets of UVAS. To inculcate, in the students, knowledge of English as Language not as subject, Pakistan history, sociology, Islamic values and norms with the requirements of modern period to make them good citizens and professionals. To empower thoughtfulness of various social phenomena and human behavior within a given social structure. To enhance understanding about local and international social issues.